Every year, thousands of od students join LNMU Darbhanga in their various courses offered from different colleges under LNMU. Most of them join it for three-year degree program for which the admission online application goes live normally after the result declaration of Board's 12th result. 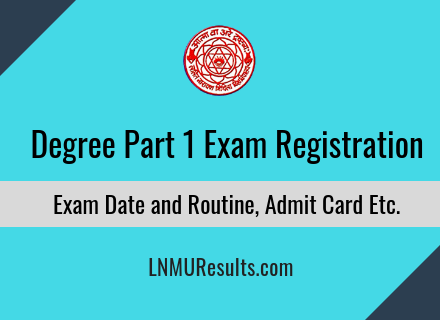 Well, In this post, you can get detailed updates on the LNMU Part 1 Registration Online Apply and updates related to it. We will also share the Process of applying online, Application fee and Expected date of examination. Stay tuned and we will get you updated! Usually, after the 4-5 months of admissions, LNMU releases the notification for the examination and registration process goes live. Now from this year, the process of taking the admissions in the 1st-year-degree program and even the registration process is organized by OFSS, also known as Online Facilitation System for Students which is managed under Bihar Board Patna. If you are the one, appearing in your 1st year of the 3-year degree program, you are going to find this post extremely helpful. 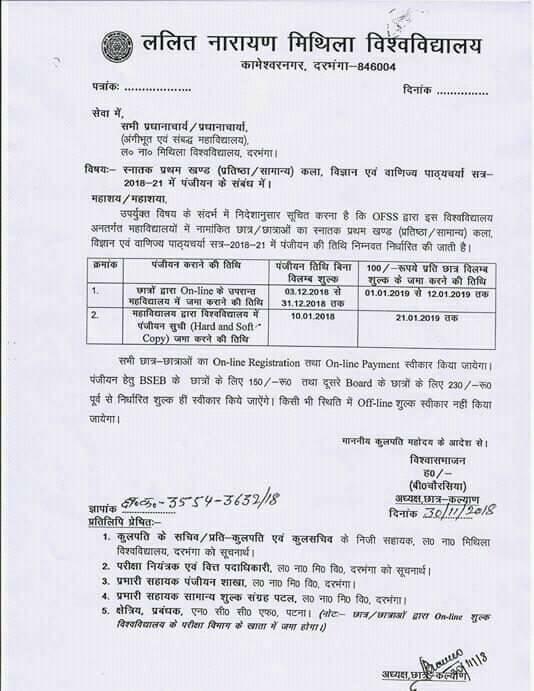 Recently, in a notification shared by LNMU, it is mentioned that the Registration for degree 1st year of all the three streams - Arts, Commerce and Science for the session 2018-21 will go live from 3rd December and will end till 31st December 2018. Also, by paying Rs. 100/- extra fine, candidates can fill their online registration form from 1-1-2019 to 12-01-2019. Here's a detailed preview of the Registration Process timeline and details regarding the Application fees, with or without fine. Information regarding LNMU Part 1 Examination Date and Admit Card Downloading will be updated as soon as it is released officially. Meanwhile, you can watch this space for the hourly updates. Follow the below steps carefully and you will have no issues filling your online applicaton. If you are having issues in any of the steps, don't panic, ask below in the comments section and I will get back to you! First of all, Go to this link. Now, You will see a form with multiple input fields asking your login details. If you have the ID, Password which was used during admission, then use it login or Rest your password in case you don't remeber it. There's a Create Account option in case you don't have an account registered. After loggin in, Fill up all the details according to the form. Upload any document if asked and move to the payment section. MMake your online payment if you have any card or netbanking available. That's it. A receipt will be generated and visit you college for the further proceedings on that. If you have anything else to ask regarding this Examination or Registration Process, drop a comment below and I will get back to you in no time.